As the world leader, Daikin develops advanced HVAC systems providing comfortable, healthy environments for people around the globe. Their products can be found everywhere from towering skyscrapers to private homes. Advanced systems require advanced controls. The Daikin One+ Smart Thermostat was designed from first principles to optimize user experience while seamlessly integrating with the most sophisticated architectural environments and HVAC systems. The simple rectilinear form frames an analog scroll wheel on the right side for quick, on-the-go temperature adjustments and a color touch interface on the left side for more in-depth control and setting. A sense of calm sophistication is projected by the minimal metal and glass facade. The user interface evolved from a thorough evaluation of relevant control paradigms and technologies. A combination of light, analog, and digital interface elements result in a device that works equally well for understanding system status or making quick temperature adjustments as well as more in depth environmental control and scheduling. One test user put it very succinctly in saying, “This is exactly what a thermostat should be”. 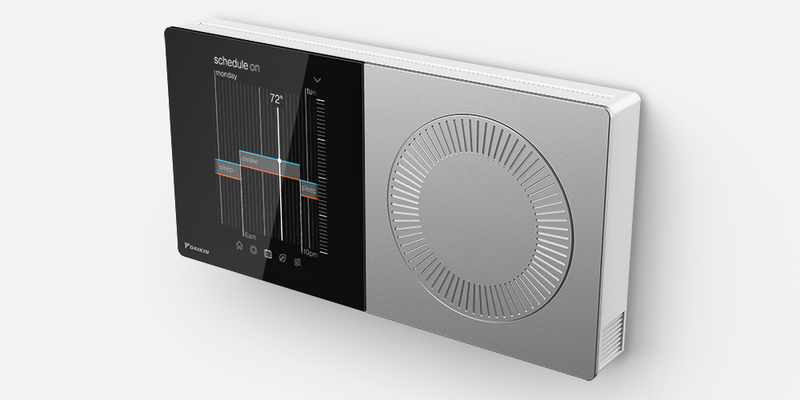 Daikin collaborated with Bould Design for the Industrial Design and Dubberly Design Office for the UI/UX. The Daikin One+ design process meticulously considered and addressed every possible user need. It represents the state of the art in modern thermostat design.